Mum of Five Staying Sane: Can you DIY on a budget?. Our top tips including bargain hunting, upcycling furniture & buying secondhand or nearly new items. Can you DIY on a budget?. Our top tips including bargain hunting, upcycling furniture & buying secondhand or nearly new items. Can you really DIY on a budget? When I first start looking into doing a room makeover it soon started adding up once I added in all of the paint, wallpaper, carpets, accessories, lighting etc... for each room. I think at the moment every room in our house needs a freshen up. Rooms that you think you only decorate a year ago when it was actually four years ago are looking a bit tired and in need of some TLC. However, when you have some many rooms needing a makeover how do you do it on a budget? Shopping around is a firm favourite of mine. Although does require some patience too! Don't just go with the first shop you find for everything. If you can hold off until offers pop up on paint i.e; 3 for 2 or two pots of paint for X amount that saves some pennies straight away. Also look out for end of line ranges etc.... My Mum recently picked up some pink Dulux paint in a local store reduced to just £2 per 2.5 litre pot as it was old/end of range stock. That's paint for Thing 3's bedroom sorted and at a cost of just £4. eBay is a good place to look for new furniture if you are looking to add new pieces or replace existing furniture. You can buy new items on eBay as well as good condition secondhand pieces and it's always worth a look before you pay full price in store. If you do end up looking at buying new always search for discount codes for the stores you are looking for. There is sometimes valid discount codes or even a discount if you sign up to the stores email newsletters. Upcycling furniture is also a good idea. 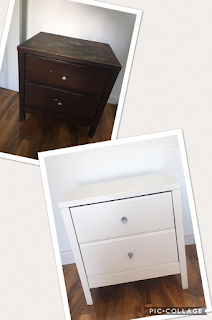 I recently upcycled our bedside tables as the dark wood was really depressing me! The furniture itself was still solid but it was the colour that bothered me and they needed a freshen up. I bought a tin of furniture paint from our local Wilkinson store and some crystal drawer handles from Amazon. All in it cost £17 for both bedside tables and I think they look much better although far from perfect as it was my first project! DIY, do it yourself. Every day I tell myself it would be much easier just to get the professionals in to paint, lay carpet, replace the kitchen etc.... but that also comes at a price. So if you can give it a go then do. 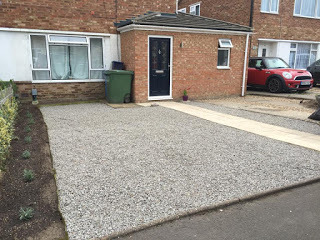 It may take longer than a professional would take and it may not be perfect but having done it yourself you can save lots and you can say 'I did that' even if it's closely followed by 'and I'm never doing it again'! More recently we decided to decorate the hallway. The stair carpet was cream and had seen better days. 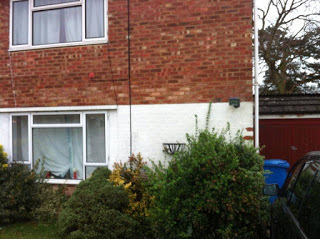 We were going to replace it when we did the extension but our budget didn't allow it and it just got left until now. 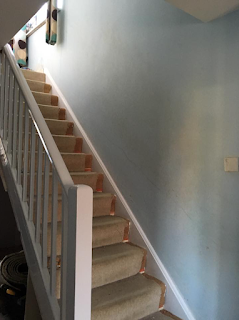 So yet again my Mum found a bargain on eBay and with the help of some Dulux Chic Shadow paint that we had bought for something else but was ready to use and a brand new piece of underlay and carpet from eBay for the grand total of £1.98 we transformed our hallway. We do need to find new curtains and a new light fitting but I am still shopping around for those! Before and after of our stairway. I cut the cream carpet so I could gloss the woodwork without taking up the whole carpet and having kiddies tread on the gripper rods! The OH fitted the carpet and whilst it's not perfect it looks fab. So remember with DIY. Shop around, look for bargains, reduced items or discount codes. Try a bit of upcycling of existing furniture too. Don't rush things if you don't need to and enjoy decorating!